What is the Royal Arch? So, said Graham Greenall, newly installed master of Academy Lodge No 9382 on the day of his attaining the chair of King Solomon. Perhaps it is not surprising with such a fine selection of officers and brethren present. Pictured from left to right, are: Philip Gunning, Graham Greenall, Norman Pritchard and Kevin Poynton before the ceremony. Principal guest for the evening, Deputy Provincial Grand Master Philip Gunning, was admitted with due ceremony, accompanied by Assistant Provincial Grand Master Kevin Poynton, grand officers Dennis Rudd, Andy Barton, Gordon Amos, Andrew Whittle and Chris Eyres. These were supported by acting Provincial grand officers Barry Fitzgerald, Christopher Maloney, Eric Bailey and Steve Clarke. Graham was proclaimed for installation by Vic Charlesworth and Andy Barton, and was then installed into the chair of King Solomon by that stalwart of Masonry, the WM Norman Pritchard. The installing senior warden was Gordon, the installing junior warden was John McIntyre and the installing inner guard was Robert Williams. The third degree working tools were presented by John Wright (a junior brother), the second degree working tools by Darren Poole, while the first degree working tools were given by Warren Whalley. Addresses were given to the new WM by Norman, to the wardens by Colin Boardman and to the brethren of the lodge by Philip Gunning. Norman presented Philip with an envelope for charitable donations for the sum of; £300 to the MCF 2021 Festival, £300 to Ecclesholme, two cheques for £200 to Warrington Masonic Hall, £100 to the Warrington Masonic Museum and £200 to Newton Community Hospital making a grand total of £1,300. 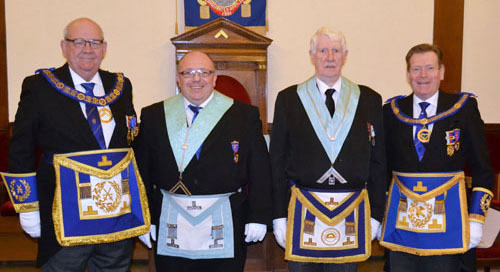 Philip thanked the brethren of the lodge on behalf of the recipients for their generosity. 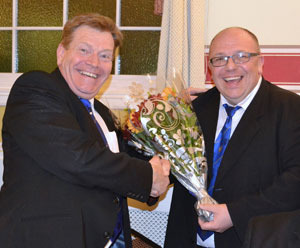 Graham (right) presents Kevin with flowers. After the excellent meal, Philip made a point of celebrating the quality of the work performed by Norman, the acting wardens and the inner guard, all part of the installing team of past masters, and accordingly congratulated the team for their excellent work. The raffle during the evening raised a very creditable £227. At the end of the night, Academy Lodge routinely celebrates their Founders in a toast. As usual for Academy Lodge, the ladies of lodge members, (12 on the night), dined and were entertained separately, joining their partners at the end of the festive board. A thoroughly civilised idea. Story by Eric Kehoe and Eric Miller, pictures by Paul Thompson and Eric Miller.